Bold Ventures and Northern Superior Announce Amber Drilling Results- Discover New Gold Bearing Trend, Lac Surprise Property, West- Central Québec - Bold Ventures Inc.
Toronto, Ontario, July 11, 2016- Bold Ventures Inc. (TSX.V:BOL)(“Bold”) and Northern Superior Resources Inc. (TSX.V:SUP)(“Northern Superior”) are pleased to announce the results of the Amber Zone drilling program on the Lac Surprise gold property, west- central Québec. The program consisted of over 1,700m of drilling in 12 diamond drill holes. 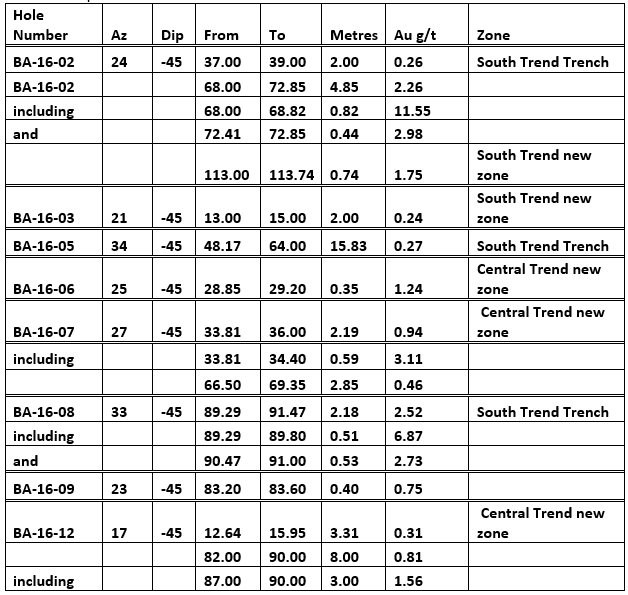 The drilling program focused on the recently discovered Amber showing where encouraging gold assay values from grab samples (ranging from 0.81 to 28.6 g/t Au) and channel samples (0.02 up to 10 g/t Au over 1 m, including 26.1 g/t Au over 0.5 m) were reported (see press release, February 17, 2015). The Amber showing is one of seven new gold showings discovered on the Lac Surprise property during the successful 2014 prospecting and trenching programs. Test the results in other areas of trenching, where mapping and sampling revealed highly sheared and fractured areas with concentrations of quartz-carbonate veining and sulphides, and highly anomalous Au grades. The final drill hole (BA-16-12) of the program discovered a new gold bearing horizon within the anomalous Central IP Trend that appears to be expanding to the east beyond the Amber grid within the Lac Surprise property. The Northern I.P. Trend remains untested. That several different types of lithologies can be mineralized with gold as long as deformation in the form of shearing and/or quartz-carbonate-sulphide veining and fracturing are present, thus confirming that the gold mineralization is interpreted to be structurally controlled. A thorough quality assurance-quality control program was implemented. Samples were batched together into groups of between 16 and 36 samples, which included Certified Reference Materials, blanks and pulp and core duplicates. Samples were sent via Expedibus, or taken by the geologist, to ALS Minerals in Val-d’Or, QC. From there, the samples were sent via ALS internal shipping to Sudbury, ON for prep, with pulps sent to the ALS facility in Vancouver, BC for analysis. ALS Minerals has over 70 locations worldwide. The lab has a global quality management system that meets all requirements of International Standards ISO/IEC 17025:2005 and ISO 9001:2015. All major ALS Geochemistry analytical laboratories are accredited to ISO/IEC 17025:2005 for specific analytical procedures, with a quality program including quality control steps through sample preparation and analysis, inter-laboratory test programs, and regular internal audits. Gold was analysed at ALS using fire assay-ICP on a 30 g aliquot. In addition, a suite of 33 elements was analyzed using four-acid digest–ICP. All results stated above have passed the rigorous quality control program. Bold and Northern Superior are very happy with the results of the diamond drill program, and part of the next exploration phase will follow up on these excellent results at the Amber Zone. A budget going forward, of approximately $1,000,000 is proposed for work on the Lac Surprise Property as a whole. The recommended work is proposed for the Amber, Black Phoenix and Fox areas and consists of extending the Amber Grid, cutting a grid over the Black Phoenix gold showing (19.9 g/t Au from a grab sample and 26.1 g/t Au/0.5m channel sample) and completing additional soil geochemical and I.P. surveys over those areas. Based on the results of the recent drilling, and the proposed geochemical and Induced Polarization surveys, a diamond drilling program will be developed to test the areas within the Amber Grid, the planned Amber Grid extension as well as testing the highest priority drill targets within the Black Phoenix and Fox areas. Vanstar Mining Resources Inc., located directly to the east and contiguous to the Lac Surprise property, recently announced a drill intersection of 10.34m grading 4.43 g/t Au (see Vanstar news release dated June 30, 2016) and as a result, Bold mobilized a prospecting team to scout the area immediately adjacent to the Vanstar boundary and to assess the suitability for soil geochemistry and an Induced Polarization survey in that location where Northern Superior had previously defined four separate gold grain-in-till and gold geochemical dispersal trains (see Northern Superior Press Release, January 27th, 2014). The Lac Surprise property is centrally located within a highly prospective area of the Chapais- Chibougamau gold- copper camp, an area currently experiencing aggressive mineral exploration. The Lac Surprise property is strategically located over major regional structures associated with recent gold mineralization discoveries. These include the: a) Geomega Resources Inc.’s Anik Gold property, located directly north of and tied onto, the Lac Surprise property (see Geomega press release, February 23, 2015 and September 28, 2015); b) Vanstar Mining and IAMGOLD Corporation’s Nelligan property, located directly east of and tied onto, the Lac Surprise property (see Vanstar press release, February 23, 2015 and June 30, 2016); and c) Toma Gold and IAMGOLD’s Monster Lake property, located 10 km to the north- northeast of the Lac Surprise property (see Toma Gold press release, February 25, 2015 and June 15, 2016). In addition, these same structures over which the Lac Surprise property occurs host several gold mines and gold deposits which include the: a) Lac Short Mine and Fenton Deposit to the east; b) Joe Mann Mine and Philibert Deposit to the west; and c) Chevrier Deposit to the northeast. Northern Superior is a junior exploration company exploring for gold in the Superior Province of the Canadian Shield. The Company is currently focused on exploring its Croteau Est property in Québec and its Ti-pa-haa-kaa-ning in Ontario. Northern Superior also has a number of other 100% owned properties in Ontario and Québec. Northern Superior is a reporting issuer in British Columbia, Alberta, Ontario and Québec, and trades on the TSX Venture Exchange under the symbol SUP. Bold Ventures works in both Ontario and Québec. In Ontario Bold has several claim groups in and around the Ring of Fire area of the James Bay Lowlands. The company is also earning an interest in the Koper Lake Project located directly adjacent to the Eagles Nest nickel-copper massive sulphide deposit currently in the permitting stage. In Québec, Bold’s primary focus is on two projects. The Lac Surprise Project is located in west central Québec, approximately 50 km (30miles) south of Chapais and within the historic Chibougamau -Chapais copper-gold camp. Bold is also exploring its 100% owned Lac Grasset project that straddles the Sunday Lake Deformation Zone in the Matagami area, within the historically prolific Abitibi Greenstone belt of North-western Québec. Balmoral Resources Ltd. has seen success over the past few years in locating and expanding several gold and base metal discoveries proximal to the Sunday Lake Deformation Zone and has expanded its land position to surround Bold’s property (see Bold news release dated September 30, 2014). For more information, please visit www.nsuperior.com or www.boldventuresinc.com, or contact Bold Ventures Inc. at 416-864-1456 or Northern Superior Resources Inc. at 705-525-0992. President and Chief Executive Officer, Bold Ventures Inc.
Executive V.P., Bold Ventures Inc.
President and Chief Executive Officer, Northern Superior Resources Inc.